Kenya is an iconic wildlife destination, and boasts some of Africa's best beaches. Botswana is rated as one of the best safari holiday destinations in the world. At Travel Butlers, we offer safari holidays which are individually tailored to each client’s personal interests, budgets and needs. This means that every Travel Butlers holiday is totally unique rather than off-the-shelf. Our love of African safaris is precisely what inspired us to start our company and we have visited the majority of the lodges and reserves that we offer ourselves. This means that we’re in the perfect position to talk you through your various options and build you a safari holiday that suits you down to the ground. Below you will find some suggestions for 2019 / 2020 and if you would like to use one of these routes as a starting point for your own holiday, simply give us a call or send an enquiry. When you get in touch with us at Travel Butlers, we’ll take stock of all your needs and one of our experienced consultants will get back to you quickly with a personalised suggestion for your safari holiday. 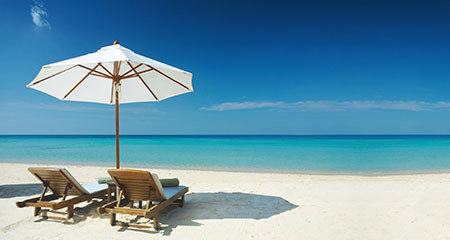 After that, we’ll work with to you tweak your trip until you are 100% delighted with your holiday. Then, you can head off into the sunset for the safari holiday of a lifetime. If you like the idea of flying over the safari plains and looking down at the wildlife from a birds-eye view, coupled with some of the best accommodation and safari experiences that the Northern Safari Circuit can offer, then an exclusive fly-in safari could be just the ticket for you. End with a few nights in 5* luxury on the beaches of Zanzibar, basking on white sands in the hot African sun, and you have an all round winning combination. The vast plains of the Masai Mara come truly alive from July through to October time, when over 1.5 million wildebeest and zebra migrate here from The Serengeti. This is truly nature at its most dramatic. If you are looking for a purely relaxing beach holiday or honeymoon, Mauritius will tick all the boxes. With endless sun-kissed sandy beaches, warm enticing waters and stunning sunsets, you can kick back and forget all your cares for a week or 2. Fall in love with Cape Town, find new wines while visiting one of the many wineries of the Cape Winelands, and tour along the Garden Route - and if these are not enough highlights for one trip, end your holiday with an amazing Big 5 safari in a malaria-free reserve. Enjoy an unforgettable safari, tour along South Africa's popular Garden Route coastline, go wine tasting in the Cape Winelands, watch whales and explore Cape Town, one of the world's most spectacular cities. Can you think of a better way to spend your holiday? If you're big on ambition but a little short on time, this itinerary combines 2 of the real highlights of South Africa into one trip. Over just one week, you'll get a real taste of the cosmopolitan Cape Town, with 4 nights to explore this brilliant city. After that, you'll whisk yourselves off into the bush for an exciting Big 5 safari. It's an unbeatable combination - a week that you'll never forget. Namibia is a beautiful country, with endless highlights - including the red sand dunes of Sossusvlei, the Fish River Canyon (one of Southern Africa's most stunning natural features), the wild desert elephants in Damaraland and of course the stunning Etosha National Park. Tanzania's Southern and Western Circuits are the remote Africa that you may dream of. Depending where you go, a safari here could include vast sweeping plains criss-crossed by wandering herds of buffalo and elephant, hippos swimming in waterways watched by crocodiles lazing on the riverbanks, leopards lounging in the trees watching wild dog pups playing in the long grass of the savannah, and chimps swinging from the branches. 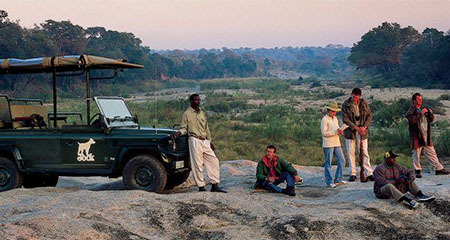 This is classic safari territory that guarantees the wildlife experience of a lifetime. If you are looking for a very special place to spend your honeymoon or take your loved one away for a romantic holiday, Africa has everything you could ever want. The heady mix of unspoilt beaches, game reserves teeming with wildlife, and stunning scenery all combine to leave you with memories that will last a lifetime. Even if you only have 7 nights to spend on holiday in Kenya, you can still combine Africa's wildlife with a few nights relaxing on a beach too. Anything is possible, even if you only have a short time! If you are looking for a truly phenomenal wildlife safari, and going to the beach doesn't really interest you, then these suggested holidays may be of interest! A Big Five safari in the Greater Kruger Park and a visit to the thundering Victoria Falls are both perennial bucket list favourites. They are two of the most unforgettable, overwhelming, and awe-inspiring experiences that Africa has to offer. Combining these magical African hotspots into one itinerary will leave you breathless, speechless and begging for more. South Africa is becoming increasingly popular with families from all over the world who are looking for a holiday that offers sunshine and beaches and plenty of activities for kids in a country that is truly family-friendly. KwaZulu-Natal has something for everyone - splendid beaches lapped by the Indian Ocean, stunning mountain scenery, wildlife, and a vibrant city life. Nowhere else in Southern Africa are so many outstanding tourist destinations to be found in such close proximity to one another. Taking your family to Kenya for a holiday will make for an unforgettable trip for everyone. A camping safari staying in small private tented camps which gets you close to Kenya's wildlife. This camping safari visits exclusive wildlife conservancies at Amboseli and the Masai Mara with game drives in 4x4 safari vehicles. 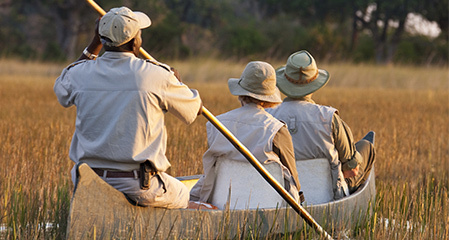 If you are short on time but you still want to experience a snapshot of Botswana's incredible Okavango Delta and it's wildlife, then these 2 night packages starting and ending in Maun might be just the ticket! Enjoy a luxury safari holiday in Botswana, combined with a couple of nights at the majestic Victoria Falls, staying in elegant and sophisticated camps and lodges in prime locations - a winning combination. Stay in some of Botswana's most exclusive and secluded safari camps and lodges for the ultimate Botswana safari experience. Your elegantly indulgent accommodation will complement the outstanding game viewing, in the company of highly trained and qualified guides. Botswana is an unbeatable destination for an authentic African safari, and the itineraries here will give you the opportunity to experience it for yourself without breaking the bank. Come and see for yourself why Botswana is now rated as one of the best places to see wildlife on the planet. Combine 2 nights at one of Southern Africa's most popular tourist attractions, the mighty Victoria Falls, with a 2 night safari in the Chobe National Park, home to one of the highest concentration of elephants to be found anywhere in the world. Create your own Botswana safari adventure from an affordable range of safari camps which are located in the key wildlife locations around the 5 major rivers in the region. This special offer runs from 15 November to 31 March only, and is a very special time of the year to visit. During this season, rainfall and vegetation are plentiful, mammals are healthy, and many species bring their young into the world at this time. The bush is emerald green in colour with an abundance of flora and large flocks of migrant bird species. These safari packages are ideal for those people who want to keep the costs of their Kenya safari down and who are flexible with their travel dates, as the tours depart weekly on set days from Nairobi. If you have already been on a traditional 'Big 5' safari, maybe this time you are looking for something a little 'different' but which will still enable you to enjoy South Africa's wildlife? For the epitome in luxury travel, why not consider taking a classic train journey across South Africa's beautiful countryside as part of your holiday plans.